Meghan Markle attended the Invictus Games opening ceremony but the Hollywood actress was seated nowhere near her boyfriend, Prince Harry. In fact, Meghan looked like she was seated about four rows away from Harry at the Air Canada Centre on Saturday night. About 550 competitors from around the world take part in 12 different games during the Invictus Games. According to reports, Meghan was heavily guarded at the opening ceremony and at one point a security guard blocked a fan from taking a picture of the brunette beauty. Meghan sat with Markus Anderson, a friend and a party consultant. Prince Harry meanwhile sat next to Canadian Prime Minister Justin Trudeau and U.S. First Lady Melanie Trump. Even though many royal observers predicted that Meghan Markle would attend the opening ceremony, they are surprised that she was seated so far away from Prince Harry. Many media outlets and reporters were hoping to at least get a shot of Harry and Meghan together but that didn’t happen. There’s a strong possibility that Harry might have planned it this way. 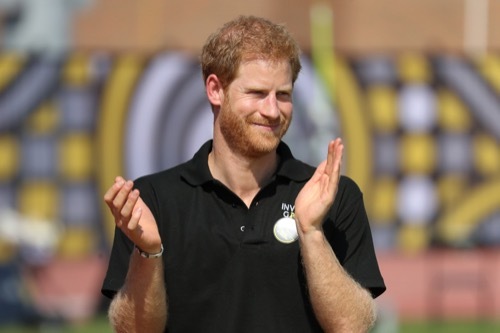 There’s a possibility that Prince Harry knew that if he were to stand side by side with his girlfriend Meghan Markle, the media would be focusing on the two of them together rather than the athletes at the Invictus Games. Either way, with Meghan there everyone was still talking about her and Harry. At this point it’s safe to say that they are definitely committed to one another and are planning a future together. It’s only a matter of time before Harry makes things officially by proposing to her. After that, Meghan will be able to sit by Harry everywhere they go as both a royal princess and his wife. Until then, fans will just have to wait and see. So far Prince Harry has not made any comments about Meghan Markle are what their next step will be. In the meantime, don’t forget to check back with CDL for all the latest news and updates on Prince Harry and Meghan Markle and the entire royal family right here.